The X-Men #13, September 1965 | We've Got Some Issues. The previous issue ended on the sharpest cliff hanger these books have seen so far. The unstoppable onslaught of the Juggernaut had finally arrived at (through) the door of the X-Mansion. Now, our teenage mutants lay strewn about the X-foyer, covered in rubble, wondering if there’s any way at all to take this goliath down (Spoiler: there is). The entire issue is pretty much a rumble. 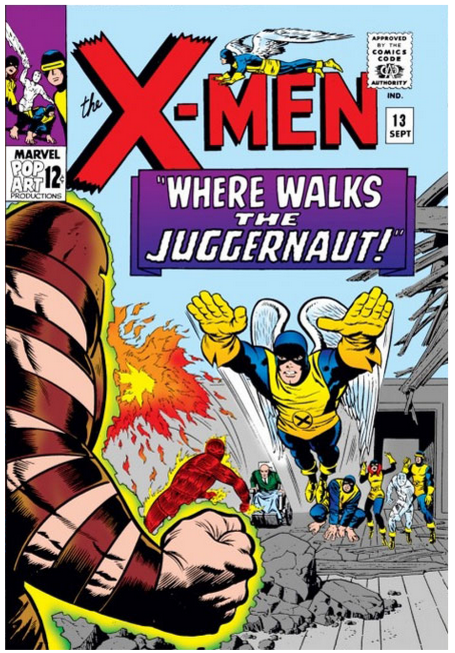 Xavier, Jean, and Cyclops all take their early shots at Juggernaut but to no result. “See the power of the Juggernaut! My body is so charged with boundless energy that I exude waves of force even when standing still!” These waves of “force” have an inconsistent repelling effect: Xavier’s chair is thrown backward and Jean’s telekinetic power is somehow “shattered”, but at other times, Juggernaut is vulnerable to physical attacks. 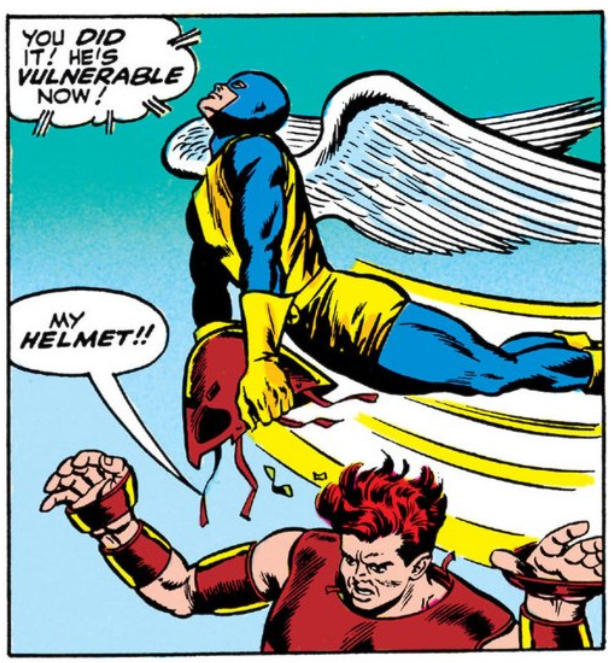 Also, it’s revealed that Juggernaut’s helmet is made from the same magical material as his Bands of Cyttorak (whatever) blocking any of Xavier’s mental attacks (also whatever). Cyclops, unable to really land any direct strike, takes to using the crumbling arena of the X-Mansion against Juggernaut. He blasts away at the floor, coring out a dead fall in no time. New penciler Jay Gavin provides a neat and elementary cross-section of the maneuver. What unfolds from here is a story strand that makes no sense for a couple of reasons. The Mento-Helmet needs to rev up, okay; so while the X-Men take a pounding in the hallway, Xavier stays put in his workshop. But then, strangely, he says, “My mental power is already so highly charged that I must unleash some energy… I’ll send mental waves out over the heart of the city… releasing them will act like a safety valve to me!” So, what is the purpose of this exercise again? We’re charging brain waves for a mental attack on Juggernaut, right? Why dispel any energy at all? Why not bring it all to bear on Juggernaut at once? It’s unclear if Xavier lacks a plan or if he’s just playing it close to the vest—which he does a lot. Happily though, this “need” to unleash energy results in a pretty cool sequence. We track the Professor’s bright green, zig zaggy “brain waves” over NYC where they are passively received by airline pilots, teenagers toying with a HAM radio, a blind courtroom lawyer named Matt Murdoch, and finally Johnny Storm of the Fantastic Four. 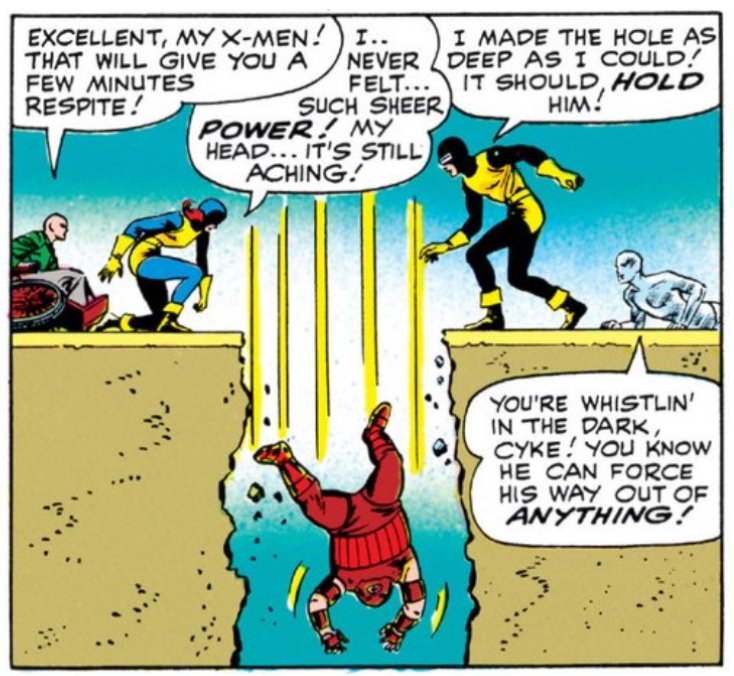 Meanwhile, Juggernaut is Dig Dugging his way out of the ground to trounce Cyclops and Angel. 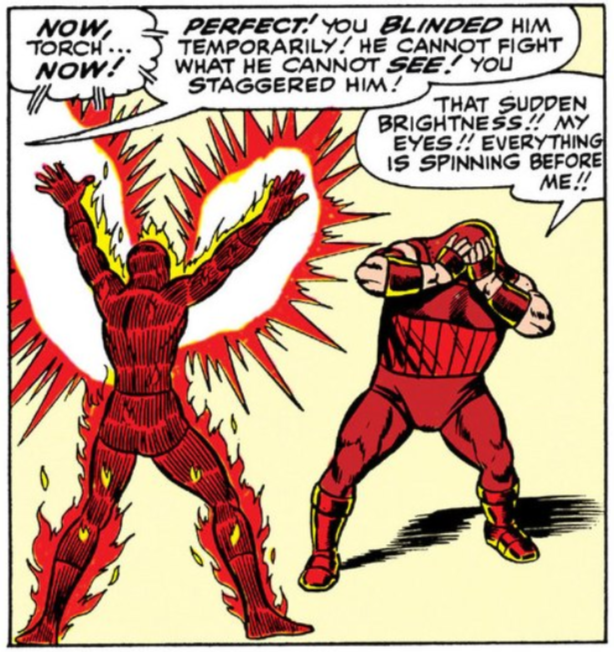 Making short work of most the X-Men, Juggernaut has more difficulty with Beast. 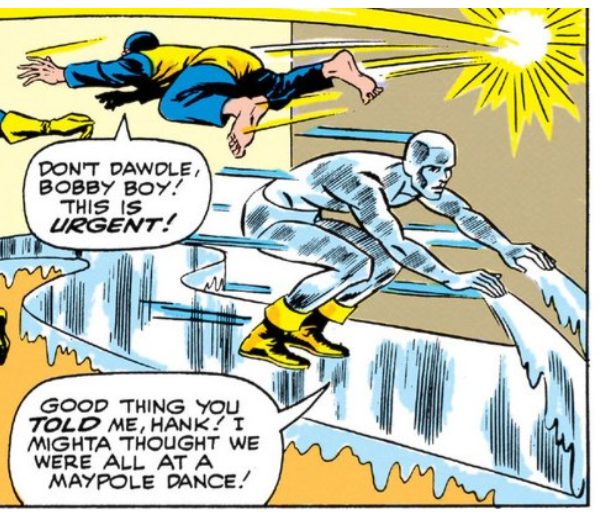 The most verbose mutant on the roster, Beast ricochets about the mansion, taunting and distracting Juggernaut in a dazzle of gymnastics, ultimately corralling him straight into the Danger Room. 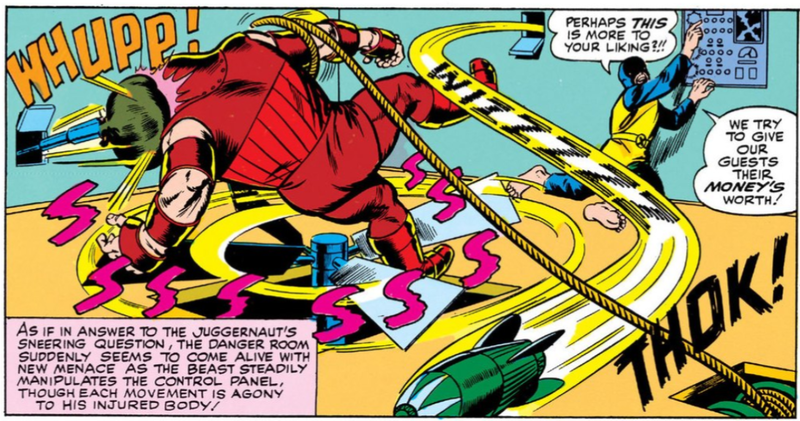 Here, Beast uses every tool and toy available (jets of chemical flame, missiles, a rope) to pummel Juggernaut while Xavier enacts his plan (if he really has one). 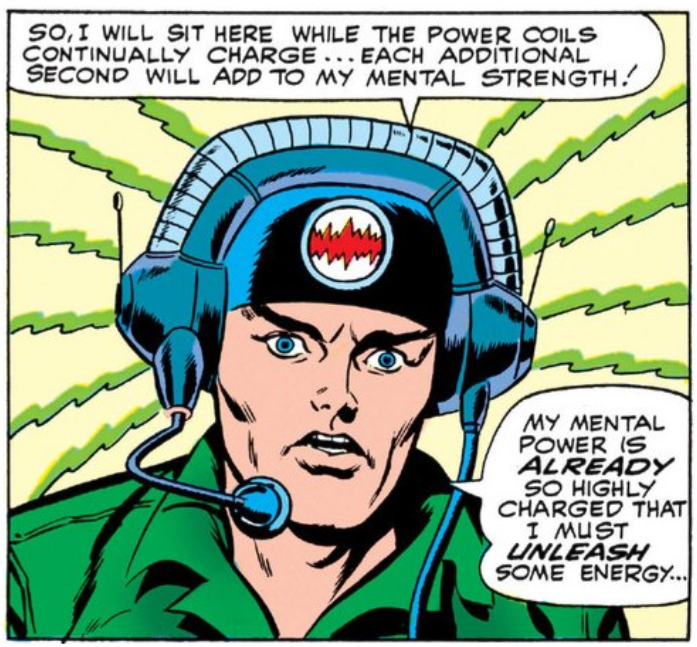 Originally, Xavier’s Mento-Helmet was deployed to amp up his brain-waves for a mental assault on Juggernaut, but that strategy seems to have been abandoned. 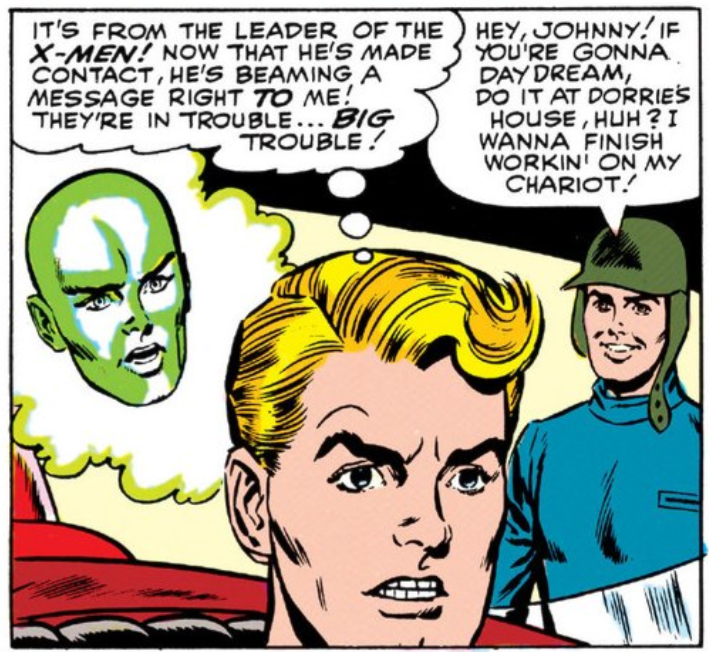 Now, Xavier is soliciting Johnny Storm/The Human Torch’s help because, well, why is actually kind of unclear. So far everything has failed against the Juggernaut. 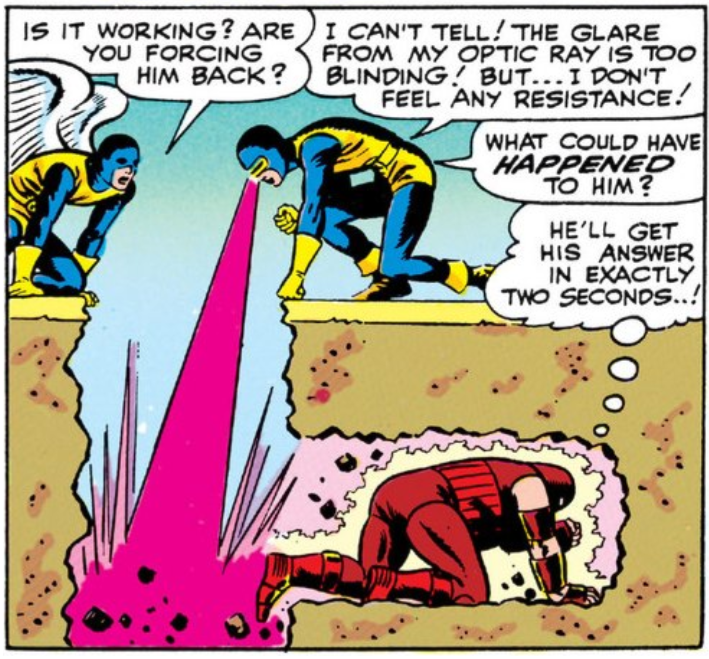 Cyclops’ optic blasts are shrugged off, Jean’s telekinesis is outmatched by his brawn, and Xavier can’t penetrate the villain’s helmet to get to his brain. So what’s the Human Torch going to do? 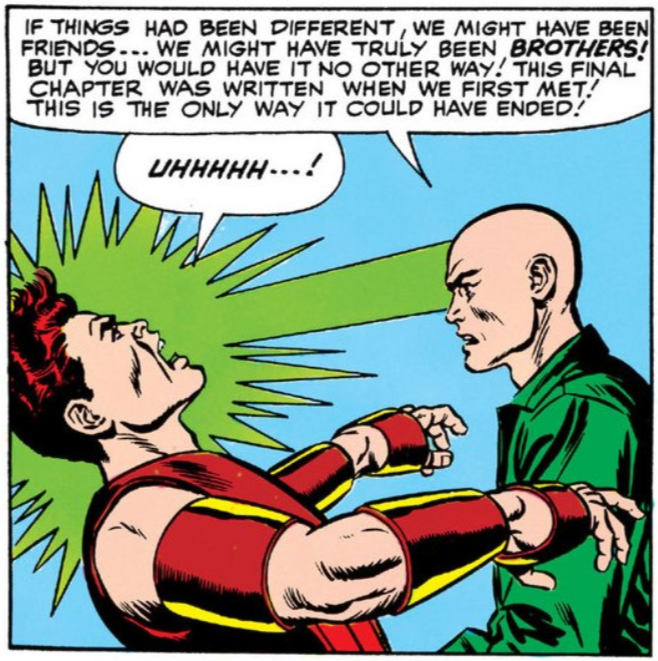 Apparently, while wrasslin’, Beast loosened Juggernaut’s helmet, The Human Torch (who happened to be nearby and available) was then tasked with blinding Juggernaut, allowing (somehow) Angel to remove the helmet, ultimately clearing the way for Xavier to deliver the final mental blow to the worst step-brother in the world. And, why not?, let’s end it with some light sexism. For some reason, Jean gets nurse duty while the boys on the team recuperate. As we all know, the Juggernaut will return and he’ll enjoy a rich career as an X-villain. But let’s set aside what he’s going to do and focus on what he’s accomplished here. This has been the best character introduction so far: it’s been a layered, dramatic, and ultimately resonate debut, and the X-World is richer for it. Rather than a monster-of-the-week appearance, we’ve got a nuanced new character who adds some much needed dimension to Xavier himself. And while we’re at it, how about the fact that Xavier has never really faded into the background here? For the past twelve issues, Professor X has been more or less front and center, active, a player with agency. It might be easy to expect that the main character in all of this would have been Cyclops, or maybe Angel, with their neutral good looks and visually spectacular powers. But that’s not the case. So far this really has been a team book, unquestionably led by the hairless, physically handicapped, often curmudgeonly adult of the group. It’s impressive (in a weird, positively-biased way) that the Prof gets as much screen time as he does. While the book is certainly deepening the histories of its characters and adding new ones to the gallery, one senses it won’t be long before the inevitable return of Magneto and his evil brotherhood. The hope is that when they do return, they bring something new to the table with them, after all the X-Men have developed some in their absence.